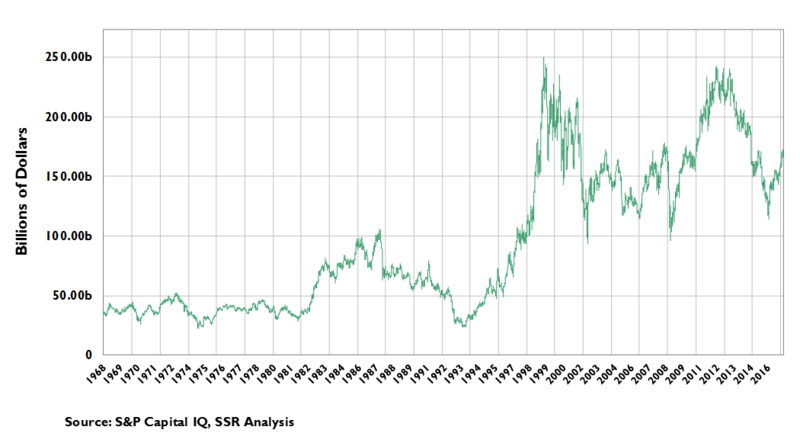 SSR LLC – IBM: Are We There Yet? While IBM portrays itself as declining legacy business soon to be offset by a growing set of strategic initiatives, we see at least 4 layers to the story. 1. Legacy products and services (56.4% of 4Q16 sales) have sharply declining revenues but strong margins and cash flow (very low opex/capex). Further deterioration is inevitable but could moderate. 2. Non-cloud strategic imperatives (24.3%) address high priority applications but are targeted at private data centers. Sales growth (-2% YoY in 4Q16) has stagnated as category spending is threatened by cloud-based alternatives. 3. 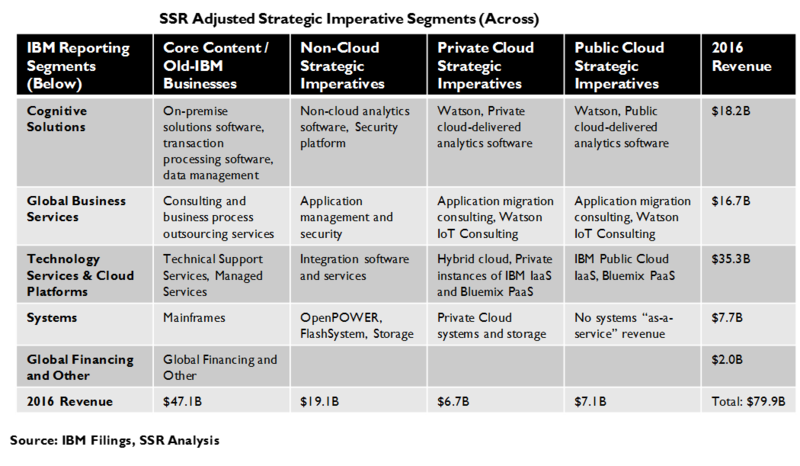 Private/hybrid cloud strategic imperatives (9.4%), where IBM collocates and manages datacenter assets on behalf of customers, are growing nicely (+12%) and are likely profitable. We believe that most of these customers will eventually transition to lower cost and higher performance public cloud solutions, suggesting an inflection point for the category in a few years. 4. Public cloud “as a Service” sales (9.9%) are growing at a 62% YoY rate, and may not yet be profitable. Watson, mostly in this layer, has a well-differentiated position for attractive vertical opportunities with its enterprise customers and should drive strong, mid-double-digit growth for several years. Summary We expect IBM to return to sustainable growth within 3-5 quarters. For investors, timing will be critical, as disappointments are still likely ahead of the inflection point. Still, IBM’s valuation is modest and should see significant appreciation, once the market is convinced of its forward narrative. IBM’s legacy business on a long tail decline. The erosion of IBM’s traditional datacenter products and services is unambiguous. Sales of products not deemed as strategic by management declined by nearly 11% in 2016, falling to less than 57% of total sales in 4Q16. 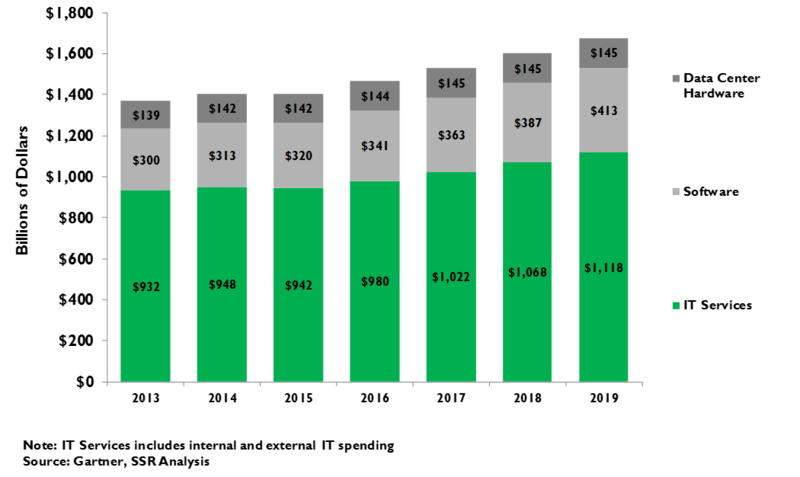 Gross margins are only slightly better than for the “strategic imperatives”, but low opex and capex make them disproportionate contributors to both profits and cash flow. 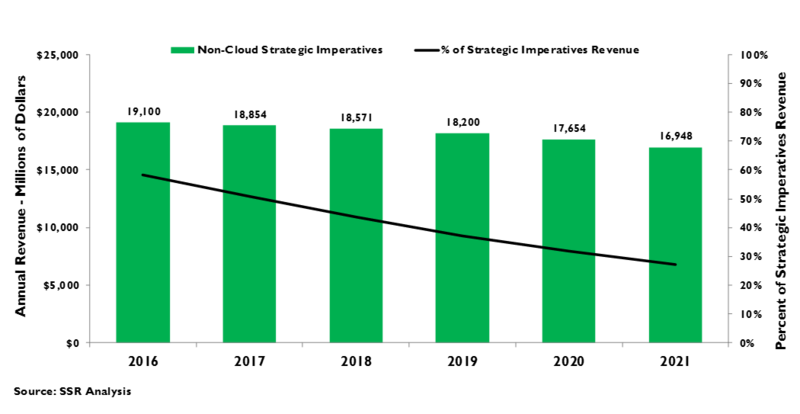 IBM believes the pace of decline could moderate, a scenario that we see as plausible, as remaining customers likely have higher switching costs. Non-cloud “Strategic Imperatives” slipping. More than 55% IBM’s “strategic imperatives” sales are from hardware, software and services sold into private datacenters. While the end application served (mobile, social, security, or analytics) may be a customer priority, these sales are threatened by the generational paradigm shift to the cloud. Sales in this category declined nearly 2% YoY in 4Q16, growing just 1.3% for the full year. We look for further deterioration going forward. Private cloud sales likely to decelerate. Half of IBM’s $4.2B in 4Q16 cloud sales are for “private” implementations, by which IBM co-locates and manages customer owned platforms in its facilities to offer virtualized services to end users. Without the scale economy and utilization benefits of a public cloud hyperscale datacenter, we see these arrangements as a cautious first step, facilitating a future move to SaaS, PaaS or IaaS. IBM’s strength in the category positions them well to manage those migrations. We expect this category to decelerate to an eventual inflection point a few years from now. IBM’s public cloud is growing fast from a modest base. In 4Q16, IBM did $2.15B in “as a Service” (aaS) sales, up 62% YoY. This includes applications (SaaS), hosting (IaaS) and more integrated services (PaaS) provided from a common hyperscale infrastructure. IBM’s biggest advantage vs. rivals, particularly AMZN and GOOGL in hosting, is its powerful network of sales relationships, giving it a leg up in identifying and executing on opportunities to transition enterprises to the cloud. Most of Watson is included here, and IBM’s positioning and unique strategy make AI a potent weapon. We believe that this business can sustain better than 30% annual growth while reaching profitability by decade end. Watson is a strong, differentiated play in AI. IBM is a top 5 AI player with a unique focus on vertical enterprise applications, leveraging its strengths in natural language processing and predictive analytics. With most AI leaders (GOOGL, FB, AMZN, BIDU, etc.) clearly prioritizing consumer applications, and with its chief enterprise rival MSFT pursuing an ambitious horizontal application strategy, IBM has a clear field in addressing significant opportunities in industries like health care, financial services, retail, government systems, and others. 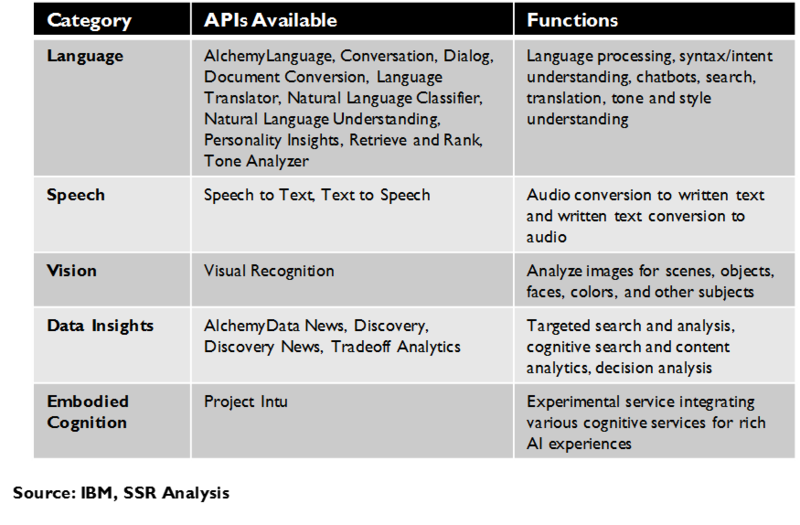 To this end, IBM has acquired valuable datasets, developed useful pre-trained APIs, and can take advantage of its well-rooted customer relationships. Watson is spread across all 3 layers of the strategic imperatives, but we believe its biggest impact will be in the public cloud. The sales inflection point is likely 3-5 quarters away. The trajectories of IBM’s four layers suggest that a transition to sustainable growth is likely, but not for at least 9 months. If the legacy business maintains a (-9%) descent, non-cloud strategic sales decline slightly, private revenue growth cools a bit to 11%, and true cloud sales decelerates to less than 55% growth, 3Q17 could be IBM’s first YoY growth quarter in more than 4 years, albeit by a very small amount. Management is promising the turn earlier, but given prior over confidence, we believe a more conservative projection is appropriate. Margins should be stable. IBM notes that the gross margins in its strategic imperatives are close to those in its legacy business. 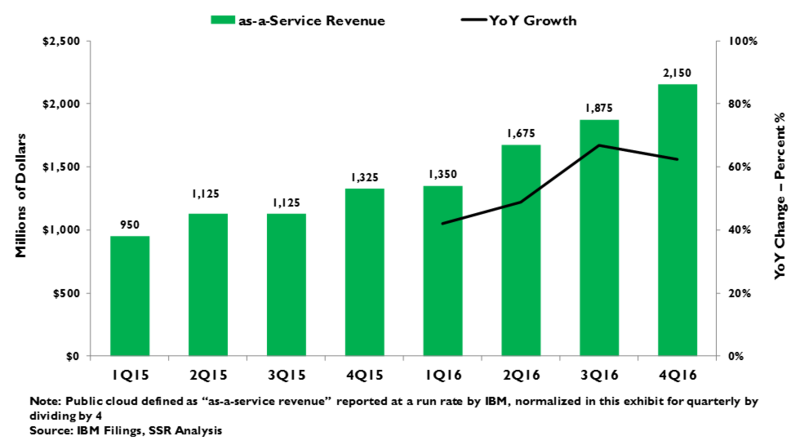 Of course, both opex and capex are sharply skewed toward the growth businesses, with obvious impact on both operating margins and cash flow. We expect IBM’s investment in these areas will be relatively flat, allowing overall profitability to remain stable even as the newer businesses become a larger share of the total. 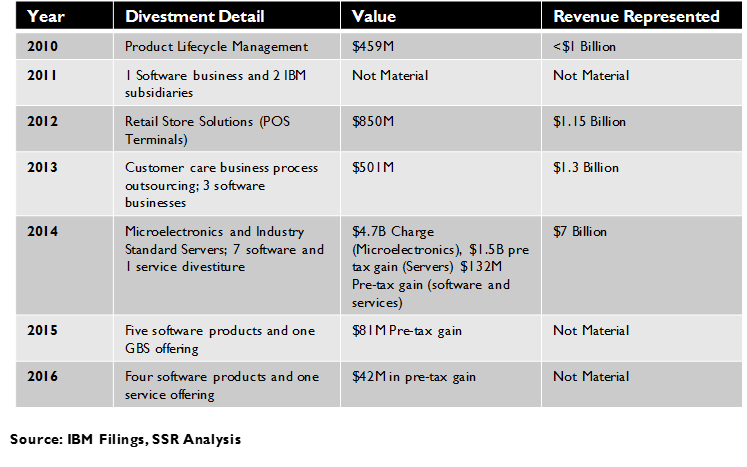 IBM valuation reflects investor frustration. IBM is up nearly 20% over the last 6 months, as investors have warmed to the idea of an inflection point. Still, shares trade at a 40% p/e discount to the S&P500, on consensus estimates of sales declines through 2018. The free cash flow yield is a robust 5.5%, supporting a better than 3% dividend yield. The average price target is $170, below the current level, and the average rating is an unenthusiastic hold. A new narrative is possible and could yield significant upside. Most analysts aren’t modeling a return to growth, and upside sales surprises in late 2017 or early 2018 could yield significant revisions and upgrades. For investors, considering IBM as a modest growth story centered on Watson and the cloud could spur a rerating to a market multiple or better, suggesting 40% upside from current levels. The trick is in the timing – expectations for 1H17 are not an easy bar. We would be a buyer on a clear beat driven by strong cloud revenues. How Strategic are the Imperatives? IBM managements wants investors to view the company in two distinct parts – a declining annuity from its legacy datacenter hardware, software and IT services businesses, and a set of growth businesses termed the “strategic imperatives”. The investment thesis is obvious: once those strategic imperatives get big enough to offset the declines of the legacy IBM, the company will turn the corner to sustainable growth. According to IBM, this should happen any day now. Some investors have warmed to this idea – the shares are up nearly 20% over the past 6 months – but many remain skeptical. IBM management has been cheerleading the turnaround through 19 consecutive quarters of declining sales. 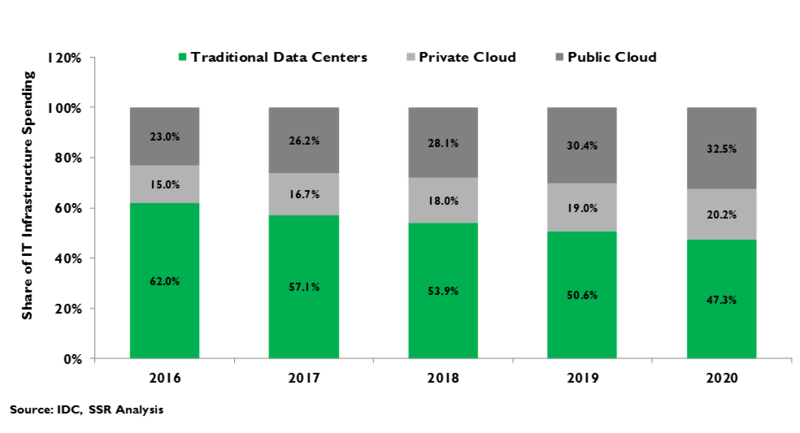 Sales associated with the self-defined strategic imperatives may have grown to more than 43% of the total as of 4Q16, but the growth has clearly decelerated. IBM’s public cloud offerings – an area that we believe will be the dominant paradigm in the next era of enterprise computing – are viewed by many as uncompetitive with those from AMZN, MSFT and GOOGL. Even Watson, the AI initiative touted as the company’s crown jewel, is derided as smoke-and-mirrors by some critics. 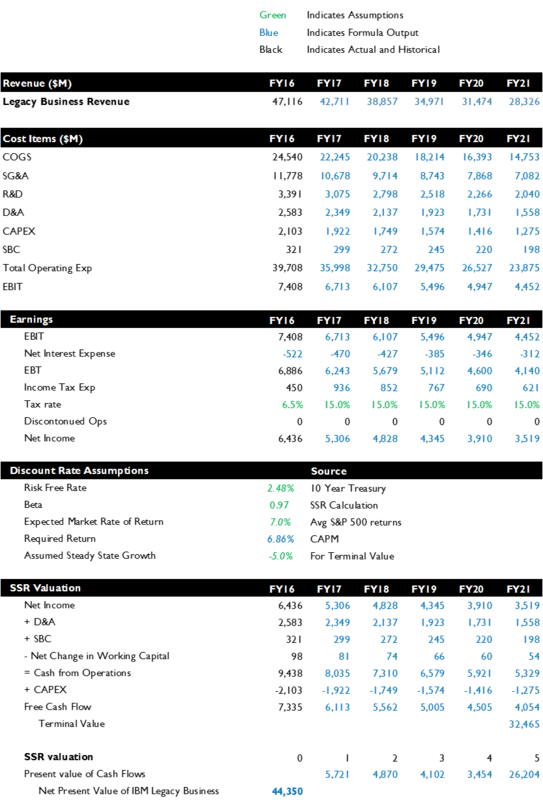 While IBM pushes the two-company narrative, it provides enough data to split it a bit more finely. The strategic imperatives can be broken into sales to private data centers and sales to the cloud. The cloud can be further divided into private/hybrid cloud revenues and public cloud products sold “as a Service”. Non-cloud “strategic” business made up 24% of 4Q16 sales, down almost 2% YoY. The private cloud was about 9%, and grew 12%, while the public cloud delivered a similar 10% of sales at a sizzling 62% growth rate. 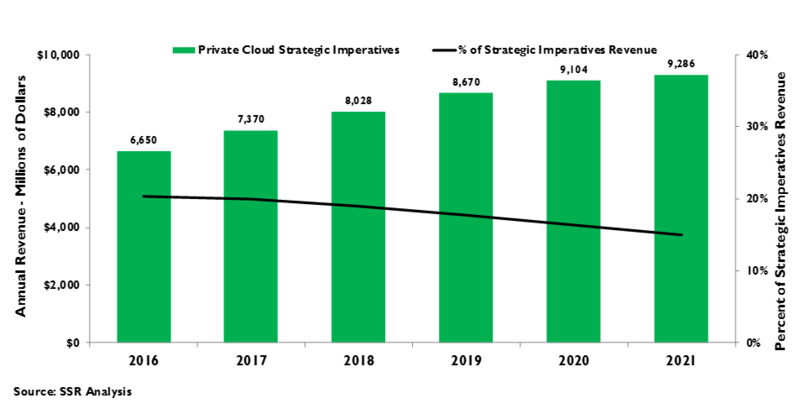 We think that the directional trends for these four segments – a slightly moderating decline for legacy IBM, a slow deterioration of non-cloud “strategic” sales, decelerating low-teens growth for private cloud, and continued 30%+ growth for public cloud (including Watson) – will continue, pushing the company toward the long-awaited inflection point in the second half of 2017 and accelerating growth thereafter. Watson is a key to this story. We believe that there are three key ingredients to AI development – talent, data and infrastructure – and IBM has strength in all three. Its roster of AI scientists is behind only GOOGL and MSFT, it has acquired unique datasets (healthcare, financial, weather, etc. ), and it has invested in an AI-tuned hyperscale datacenter platform. IBM’s AI strategy focuses addressing vertical enterprise applications, levering its industrial IT experience and deep customer sales relationships. This is an attractive opportunity worth hundreds of billions of dollars (http://www.ssrllc.com/publication/ai-sizing-the-market-big-bigger-and-biggest/). Meanwhile, the other top AI players (GOOGL, MSFT, FB, AMZN and others) have focused elsewhere, leaving IBM to compete against promising but untested startups. This is more than enough to fuel our long term growth expectations for the company. In this context, we see 20-30% upside to IBM once the growth narrative takes root with investors. Its shares trade at 14x ttm earnings, vs. a 24x market multiple. The better than 5% free cash flow yield and 3% dividend yield are attractive – if IBM can turn the corner on that nearly 5-year record of falling sales and regular disappointments. We think the timing might finally be right. IBM can trace its roots back to the 1880’s, and has been amongst the 50 most valuable US companies for more than 70 years. In an industry marked by constant, and often wrenching, change, this history is remarkable. In the past 40 years, IBM has faced down at least two potentially existential threats – first ushering in the PC era back in the ‘80’s, then executing a dramatic pivot to services and software in the late ‘90’s. As erstwhile competitors fell by the wayside, IBM survived (Exhibit 1). Today, IBM is facing another potentially existential threat. The internet era sparked a revolution in the architecture of the datacenter, traditionally IBM’s bread and butter. The new approach, pioneered by Google and adopted by every web-based business, removed barriers to the scale, enabling networks of massive hyperscale datacenters with dramatic cost and performance advantages over privately owned and operated enterprise IT operations. Application software, implemented on these hyperscale datacenters, was sold as a service, while hosting operations, led by Amazon Web Services, offered turnkey support for enterprise computing operations to run on their platforms. Investment in private datacenters turned down, as IT departments eyed a long-term transition to the cloud, and purveyors of datacenter technology suffered. While many of its contemporaries were in denial, IBM looked for a way out. It divested hardware businesses and executed huge layoffs (Exhibit 2). It acquired new businesses – like enterprise cloud-hosting pioneer Soft Layer – and shifted investment to promising technologies – like its artificial intelligence effort, dubbed Watson (Exhibit 3). Still, the exposure to rapidly deteriorating private datacenter revenues was far too great to overcome quickly or easily. Thus, began IBM’s nearly 5 year run of declining revenue and regular earnings disappointments (Exhibit 4). In 2013, IBM introduced its “strategic imperatives”, calling out investments in products and services for mobile, social, security, analytics and cloud applications and tracking the revenues it defined as coming from those areas. 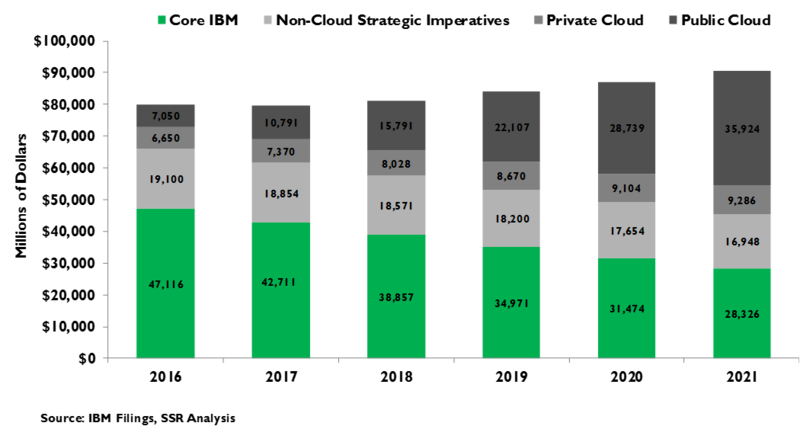 From a relatively small base, those self-reported revenues have grown to make up nearly 44% of total sales, a point presented by management as evidence of a comprehensive turn around underway (Exhibit 5). However, growth of IBM’s strategic imperatives revenues has been decelerating from the get go, down to just 14% in 2016. Skeptics see no evidence that IBM is participating in the growth aspects of mobile or social applications, see its security and analytics products as unexciting, and fear that its cloud platform is subscale and uncompetitive relative to AWS and Azure. What if the strategic imperatives are not particularly strategic? We think this is an overreaction. IBM has lumped many things into the strategic imperatives grab bag, including swaths of private enterprise datacenter sales that are seriously threatened by the cloud era. Fortunately, IBM provides enough information about the bag’s contents to allow us to unpack it a bit. More than half of strategic imperatives revenues are from products and services not associated with the cloud. 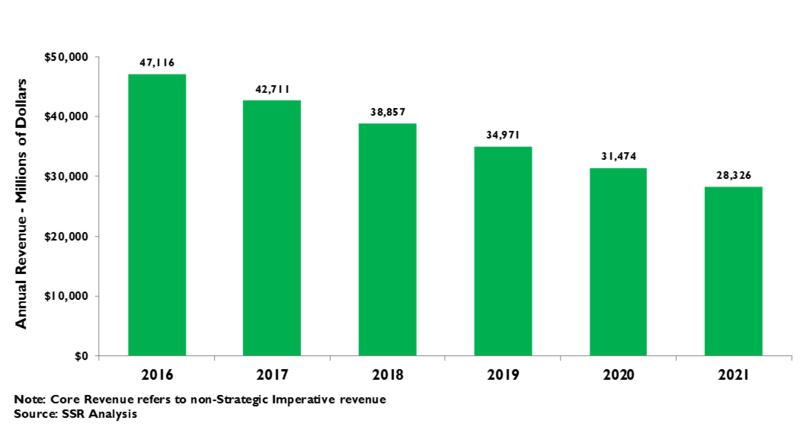 Just over 20% comes from cloud revenues not sold “as a Service” – these are primarily “private cloud” implementations by which IBM co-locates and manages datacenter infrastructure and software on behalf of its customers, offering virtualized services to users over the internet. Finally, another 20%+ comes from true cloud services offered from IBM’s own hyperscale datacenters, including much of its support for its Watson AI offerings (Exhibit 6). This category is the list of things that IBM has not included in its strategic imperatives. This includes most, but not all, of its hardware, much of its software (OS, data base management, ERP, transaction processing, etc.) other than analytics, and a lot of associated services (various forms of outsourcing, technical support, and consulting). In 2010, legacy IBM constituted 87% of company sales and still delivered 5% YoY growth in 2011, before beginning the 5-year tumble in 2012. Including the effect of the divestiture of IBM’s x86 server business in 2015, sales are down almost 50% from their peak (Exhibit 7). IBM knows that this category will never grow again. 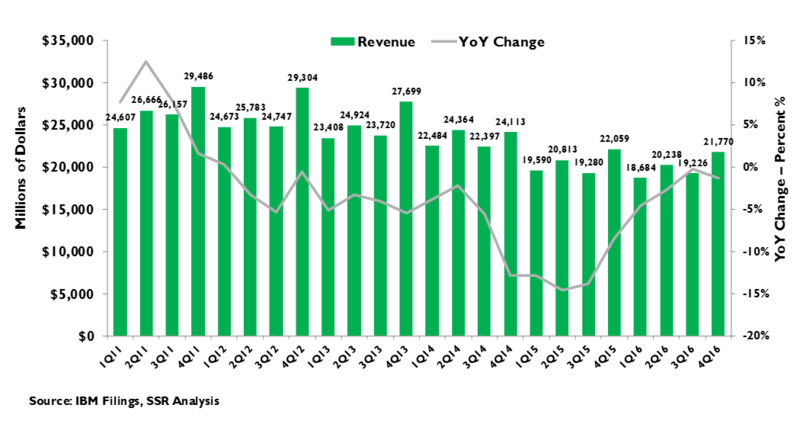 It is not investing – R&D, SG&A and CAPEX spending are likely minimal. 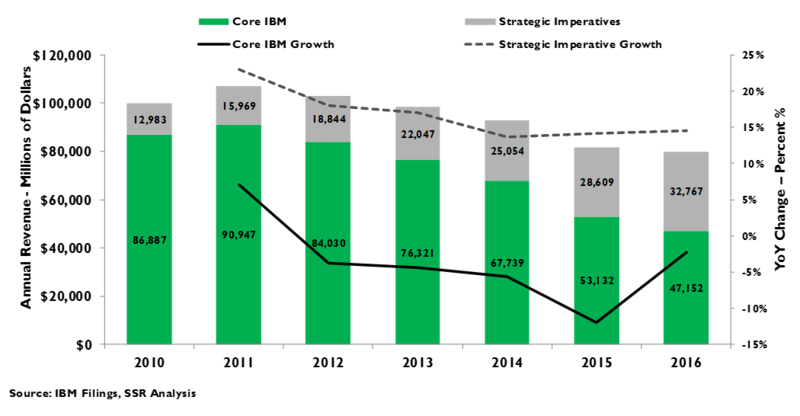 At best, the pace of sales declines might slowly moderate with stable ongoing margins and cash flow contributions. While the public market has historically struggled to support fair valuations for declining annuity streams like this, management is insistent that it is done with divestitures, likely preferring to use the cash flows to fund investments in its strategic imperatives. We project this business to settle in to a steady 9% annual decline, consistent with the performance in the most recent quarters. Assuming ongoing gross margins of 55%, supporting R&D and SG&A at 32.2% of sales, and annual capex of just 4.5% of sales, a long-tail DCF model suggests a NPV of roughly $45B or 1 times ttm sales (Exhibit 8-9). Back when IBM first defined its strategic imperatives, it likely had higher hopes for its software and services sold into private enterprise datacenters to support analytics, security, mobile and social applications (Exhibit 10). As IT departments consider what now appears to be an inevitable move to the cloud, they are increasingly hesitant to invest in their legacy platforms, even for high priority applications. Indeed, many cloud-based solutions for analytics, security, mobile and social have shown great promise, further pressuring IBM’s more traditional alternatives. IBM does sell stand-alone Watson AI solutions, but we believe this business will largely transition to the cloud as well to take advantage of the economies of scale in AI-tuned datacenter infrastructure. The most robust business is probably consulting services to customers looking to make a long term transition into the cloud. This category is 55% of reported strategic imperatives revenue and fell from low single digit growth to post a 1.8% YoY decline in the most recent quarter. 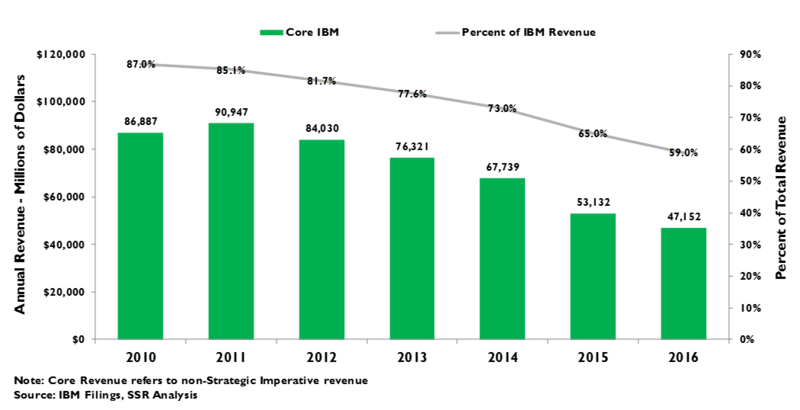 We forecast sales of non-cloud strategic imperatives to fall 1% in 2017, with the decline slowly picking up speed in future years. Profitability, probably not far off of the company average, likely improves with time, as IBM shifts its attention more fully to its cloud opportunities. Possible comparables, like data security firms Symantec and Checkpoint or analytics software rival MicroStrategy, trade for P/S multiples between 4 and 8 times trailing sales, albeit with better growth prospects than IBM’s non-cloud imperatives. Assuming a haircut to a 3x sales multiple values suggests a value of nearly $60B. To us, the term “private cloud” is something of an oxymoron, as the idea of offering cloud-like virtualized services from a physically separate platform devoted to a single customer’s use negates much of the scale economies and capacity utilization benefits that make hyperscale datacenters so compelling. Still, for many enterprises, a private cloud an important stepping stone to a more aggressive long term migration. IBM is the clear leader in facilitating this approach. IBM will implement customer systems in its own facilities. It will manage them on the customer’s behalf, implementing and maintaining software, providing networking connectivity, and supporting end users. It provides software tools and support services to help IT managers operate in an environment that may blend SaaS applications, hosted applications, their private cloud and their on-premises datacenters as an integrated system. 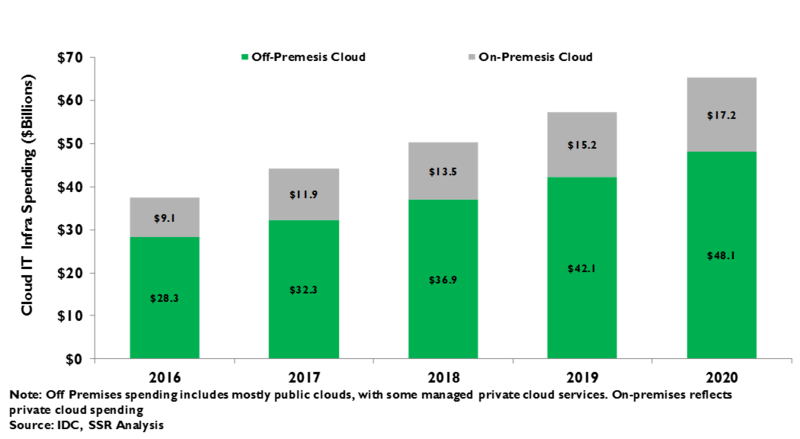 IDC forecasts that spending on private clouds will grow from 15% of total datacenter spending last year to more than 20% by 2020, consistent with the 18% growth that the category delivered to IBM in 2016 (Exhibit 11-12). We believe that the strong double digit growth of this business will moderate somewhat going forward, as customers begin to transition more applications to the public cloud. Still, this migration will be very slow, and IBM is well positioned to capture the business as it moves. We are projecting about 11% growth in private cloud for IBM in 2017, perhaps a bit conservative, tapering into single digits going forward (Exhibit 13). Comps for this business are hard to find. Equinix, which has been growing faster but offers lower margins and no technology value added, trades at a 7.5x trailing sales multiple. Applying an 8x multiple to IBM private cloud suggests a roughly $55B market value. 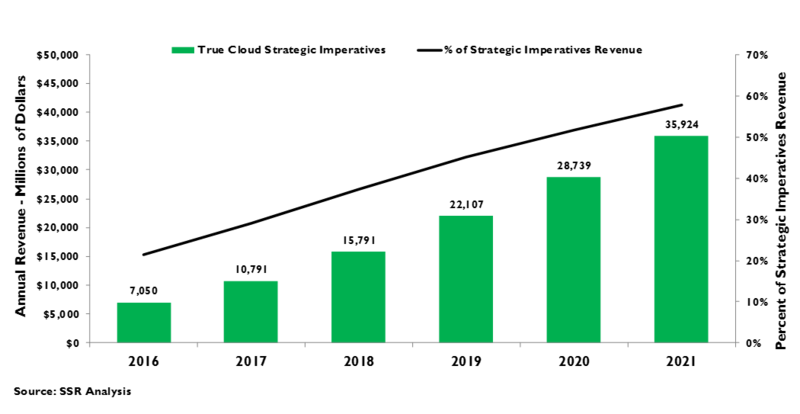 IBM’s public cloud includes its IaaS hosting business – believed to have generated around $7B in sales for 2016 – along with SaaS applications (mainly analytics, including Watson), and associated consulting and other services. Sales in this category grew 56% in 2016, notably faster than AWS, and accelerated over the course of the year – from 42% in 1Q16 to better than 62% in 4Q (Exhibit 14). We see three major opportunities for IBM’s public cloud business. The first is a paradigmatic migration by enterprises toward IaaS and PaaS hosting. We have written on the dramatic advantages of hyperscale datacenters (http://www.ssrllc.com/publication/37440/) and see most of the nearly $2T in annual private datacenter technology spending (N.B. including the costs non-technology elements, like labor, real estate and power could increase the addressable market by 50% or more)– as vulnerable to cloud solutions (Exhibit 15). While IBM doesn’t have the cost advantages that come from levering a massive consumer internet franchise, a la Amazon Web Services, Microsoft Azure or Google Cloud Platform, it enjoys the great benefits of its longstanding and deep enterprise relationships along with the industry expertise gained in vertical segments born of its consulting and software support businesses. It is also differentiated by its geographic reach –IBM has hosting locations in more countries worldwide than any of its competitors, an advantage competing for enterprise business in the many countries where local operations are favored, or in many cases required. This can also mean advantage in latency and in networking costs. Moreover, IBM has momentum from customers already working with it in hybrid cloud relationships, and an earned reputation for expertise in helping enterprises manage their transition to the cloud. We also expect IBM to take the lead with software tools and consulting services to help enterprises manage workloads across multiple cloud vendors, potentially a substantial opportunity. Overall, we believe the global cloud hosting market will grow to hundreds of billions of dollars over the next decade with IBM well positioned to build a public cloud platform business with annual sales of $40B or more by the end of that period. The second major opportunity is in SaaS software. Analytics tools are IBM’s most promising entry, with the opportunity to incorporate AI from its Watson team (more on that ahead) to offer superior performance, particularly vs. traditional rivals SAP and Oracle. IBM is also a competitor for ERP software, and can lever its cloud infrastructure, analytics and AI capabilities to gain better traction. While Microsoft and Salesforce will be strong rivals, we believe IBM is better positioned than current industry leaders Oracle and SAP. IBM has hyped its Watson-branded AI efforts to the max. From the great Jeopardy showdown to the barrage of ads showing Watson chatting with celebrities, the calm robotic voice has become the personification of AI for many people. Investors, often a cynical lot, are harder to impress. “What is Watson, who is buying it, and where can I find the revenues?” are common queries and IBM has not been entirely forthcoming with the answers. This is largely because it not really a straightforward question. Watson is NOT a product, rather, it is a set of capabilities that IBM can use to make many of its other products better. At its most product like, Watson powers a set of pre-trained AI APIs that IBM hosting customers can call to access functions like weather prediction or natural language processing (Exhibit 16). Watson is also at the core of analytics software that can be customized to greatly improve the predictive power of customer big data models. Watson is also embedded in specialized datacenter infrastructure (GPUs and FPGAs) used to develop and run AI training models for hosting customers. Watson is unique datasets – historical weather, healthcare images and patient records, etc. – available to power customer AIs. Watson is proprietary tools for automatically formatting raw data and finding recurring patterns, without the need for time consuming data transformations. Watson is consultants well-trained to identify the specific ways that AI can provide value for enterprises. IBM has strong assets in all three of the key ingredients of AI leadership. First, it has considerable expertise – critical for building complex AI applications. 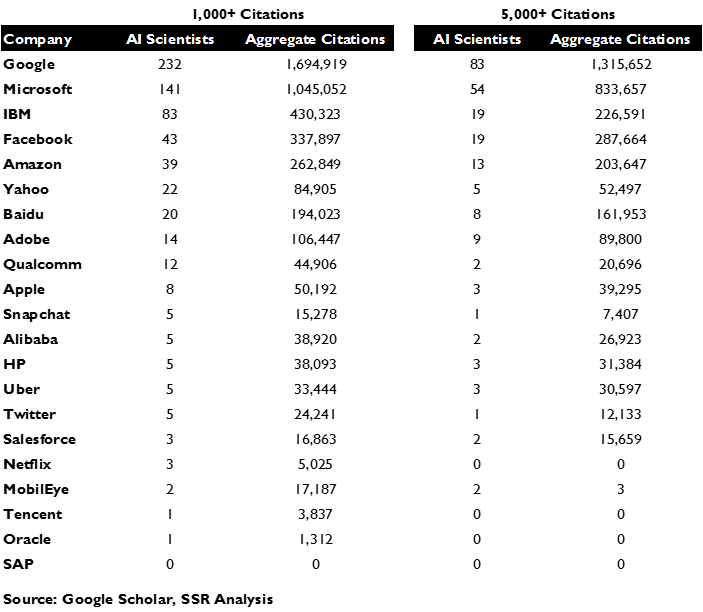 We have built an extensive database of the most cited AI scientists – see (http://www.ssrllc.com/publication/ai-where-the-brains-are/) – showing IBM behind only Alphabet and Microsoft it the number of decorated engineers on its payroll (Exhibit 17). Concerns that it might have suffered a brain drain during its 5-year downturn proved entirely unfounded. Second, IBM has its own datasets and, in many cases, privileged access to its customers’ databases. 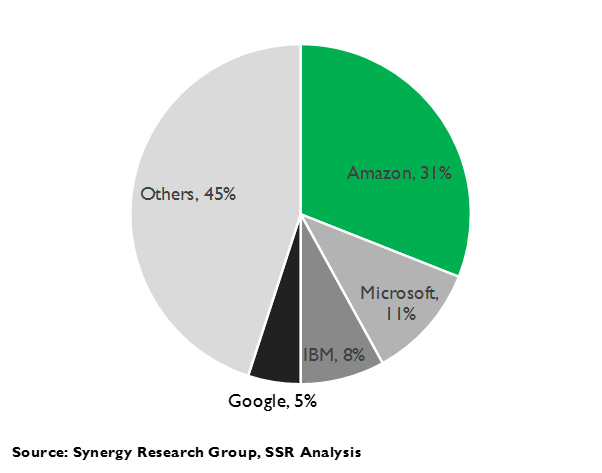 Third, IBM has invested in public data center infrastructure that is neck and neck with Microsoft for second place behind Amazon in hosting revenues (Exhibit 18-19). On top of this, IBM has another critical advantage – its primary AI rivals are addressing entirely different opportunities. Google, Facebook and Amazon are primarily focused on the consumer market (with a major side project on self-driving cars mixed in), while Microsoft is intent on using its AI to enhance its leadership in horizontal business software. At the base level, Google, Amazon and Microsoft will all offer AI-tuned IaaS hosting, but IBM has software and services layered above to serve the vertical application needs of its customer base. We believe Watson will be a key differentiator in driving IBM’s public cloud hosting and SaaS application success. We also expect industry focused AI APIs, vertical applications and bespoke development to be a substantial opportunity with few real competitors. With the next generation of enterprise computing likely to be defined by hyperscale datacenters and AI-powered software, IBM has positioned itself to prosper even as its more traditional businesses die off. IBM’s cloud business, including applications and services, is nearly as large as Amazon Web Services and growing a touch faster. Given the investment in Watson and infrastructure, it is likely less profitable than AWS, but has similar potential. Unfortunately, there is no independent valuation for AWS to use as a comparable. Facebook, which is growing at about the same pace with much higher margins, trades at more than 14x ttm sales. 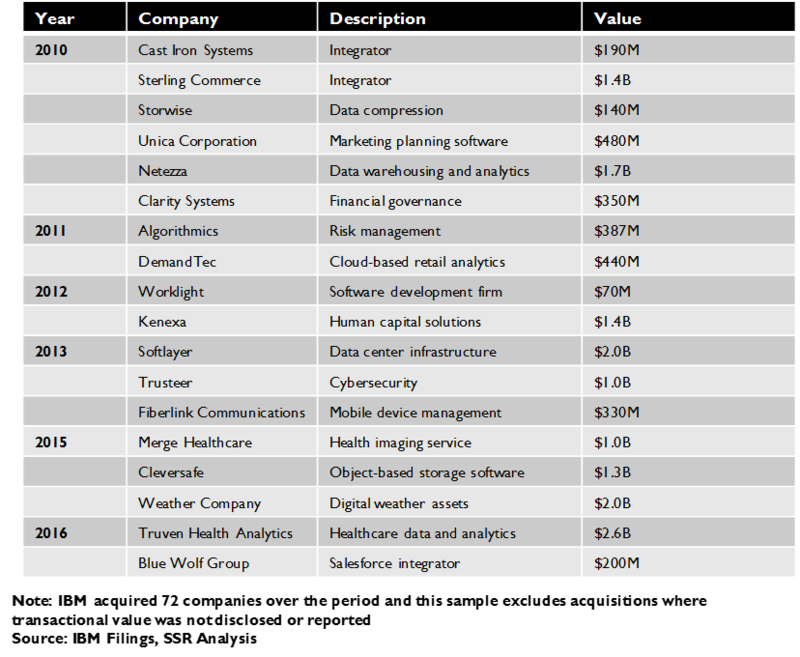 Salesforce, which is growing at less than half the rate of IBM’s cloud business, trades at about 8x ttm sales. Using a 12x sales multiple implies a valuation of about $85B (Exhibit 20). Integrating our revenue expectations for all four business categories suggests that the inflection point for IBM’s overall sales growth could be nearly upon us. Our model projects a very slight 0.2% YoY increase for 3Q17, with more definitive growth in the following quarter and clear acceleration thereafter. Margins are a more difficult call. Management asserts that gross margins for the strategic imperatives are within 500bp of its legacy business, and that they have improved as they have matured. In that context, it is possible that GMs may stay fairly stable going forward. Obviously, management has more direct control over its operating expenses. 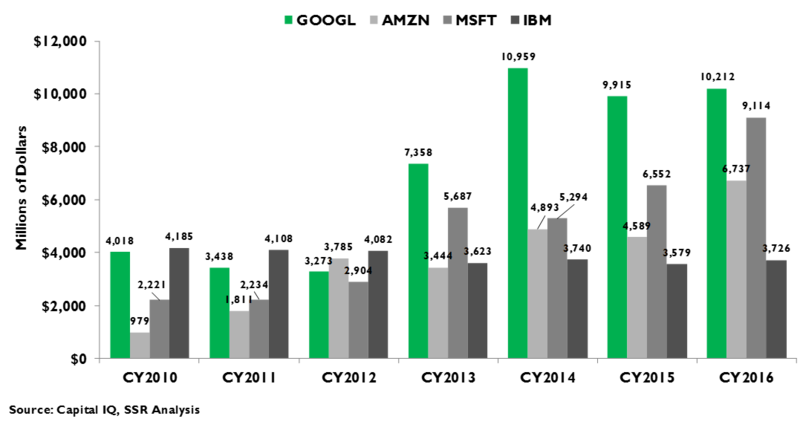 We expect CEO Rometty to try to hold the line on spending as a percentage of sales for the time being (Exhibit 21-22). Our rough valuation for the four parts of IBM comes to about $245B or an equity value of about $210B, about 27% upside from the current market cap. Given the strong run in the stock, playing against the continued sales deterioration, we suspect that an inflection point back to sustainable growth and subsequent upward revisions could result in even greater upside (Exhibit 23). At a market multiple, reasonable in a scenario of 3-4% long-term annual growth expectations, IBM shares could trade up as much as 40% from the current price. With that milestone just 6-12 months ahead, we see opportunity in buying the shares.